(1 Customer Reviews) | Write Review 4 issues per year The Director of Finance magazine covers everything you need to know about the headline issues affecting corporate finance and related issues in today’s competitive markets. Together with the latest news and up-to-the-minute features on banking, financial planning, we also provide our readers with insightful interviews and opinions from some of the top Chief Financial Officers in the UK. Director of Finance is designed to inform CFOs throughout the year when making strategic decisions about how to effectively manage their corporate finances, pensions, fleet management as well as the FD’s expanding role into HR. Chief Financial Officers act as the critical component to ensuring a stable and successful future for their business. It is becoming more frequent for CFOs to take part in major boardroom discussions where decisions are made and financial forecasts are drawn up. They are being called upon to guide strategy and lead the way for new business initiatives, not to mention manage potential risks. That’s why we aim to provide you with the most up-to-date topical issues and in-depth features that we feel will assist you in your rapidly evolving role. The Director of Finance magazine covers everything you need to know about the headline issues affecting corporate finance and related issues in today’s competitive markets. 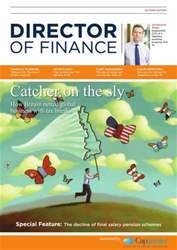 Together with the latest news and up-to-the-minute features on banking, financial planning, we also provide our readers with insightful interviews and opinions from some of the top Chief Financial Officers in the UK. Director of Finance is designed to inform CFOs throughout the year when making strategic decisions about how to effectively manage their corporate finances, pensions, fleet management as well as the FD’s expanding role into HR. You'll receive 4 issues during a 1 year Director of Finance magazine subscription. You'll receive 4 issues during a 1 year Director of Finance magazine print subscription.